Click on the General, Triggers, Names, or Energy Cost buttons to display each individual Option page. Specify the UDP Port (3700-3799) that tenEcmServer is using to broadcast ECM data packets. If you change this value, you must stop and restart the plugin from the HomeSeer Setup/Interfaces page. Specify the Network Interface on your computer to use to receive UDP packets from tenEcmServer. The Any selection should be used in most cases. If you have multiple network interface cards on your computer and you are seeing duplicate records from tenEcmServer, than specify a specific network interface from the dropdown list. Receive Timeout: The tenHsEcm12xx plugin listens for data packets from tenEcmServer. You can specify a timeout value in seconds. If the plugin does not receive a packet within the specified timeout interval, then the communications interface will be reinitialized. You should specify something 10 times larger than the transmission interval specified for the ECMs. Process tenEcmServer Packets Every nn Seconds: You can specify the frequency in which the plugin processes data packets. Packets can arrive as frequently as two a second. This is determined by the settings transmitted to the ECMs by tenEcmServer (changeable tenEcmServer options). The plugin will ignore data packets until the specified number of seconds has elapsed. Use a higher number to minimize resources used by the plugin. Accumulate Data for 24 Hours: You also specify if the plugin should accumulate the last 24 hours of detail data. This data is used by the real time chart. You can also access this data from HomeSeer scripts. You can disable this to minimize resources used by the plugin if you are not using the charting web page. Chart Refresh Every nn Seconds: You can specify the frequency (in seconds) that the chart is refreshed when displayed in your web browser. You can override this value using the rr=nn command within the chart page URL. Net Energy: The plugin tracks the net energy supplied from or generated to the power grid. 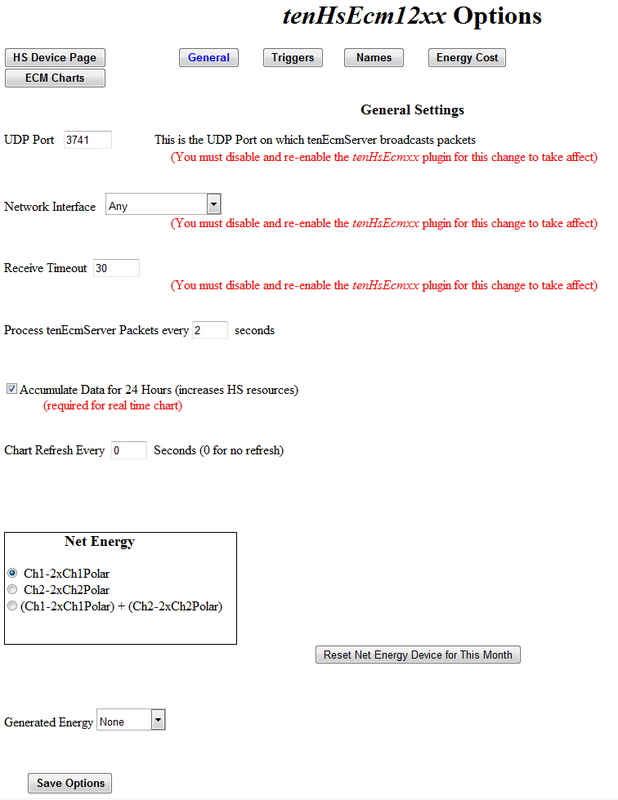 In order to compute net energy, the plugin must know which of the ECM channels are connected to the main power feed. This is usually Ch1, can be Ch2, and in rare cases Ch1 and Ch2 are connected to each of the two phases from the power grid. Select one of the radio buttons to indicate how your ECMs are connected. Reset Net Energy Device for This Month: If you have made changes to your ECM configuration or changed the Net Energy selection above, you can click on this button to reset the current Net Energy reporting period starting with the next calculation. Generated Energy: Select which ECM channel is connected to your generating source. Data packets from tenEcmServer are processed based upon the frequency specified on the General Options page. 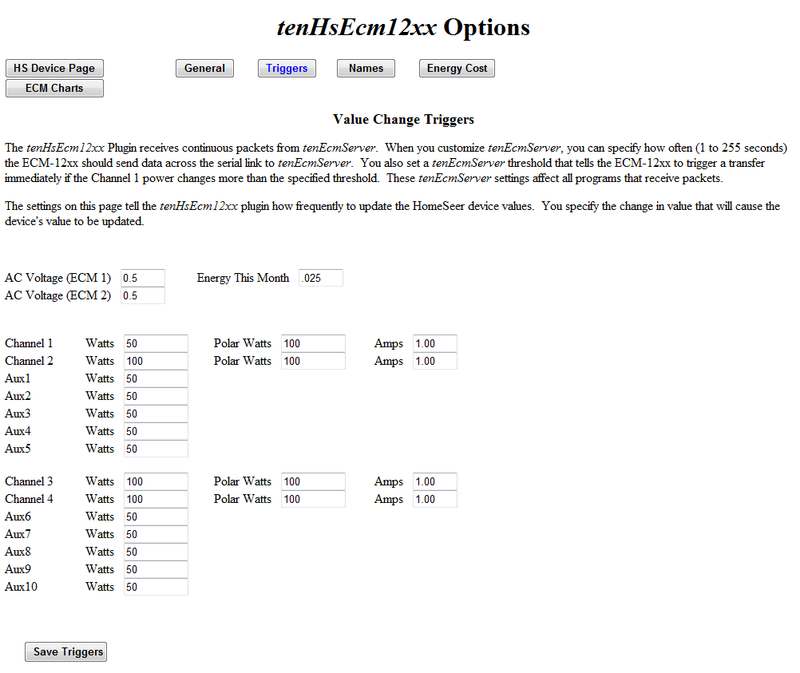 On the Triggers Option page you specify how much each value must change before its HS Device value is updated. The Triggers Option page is shown below. 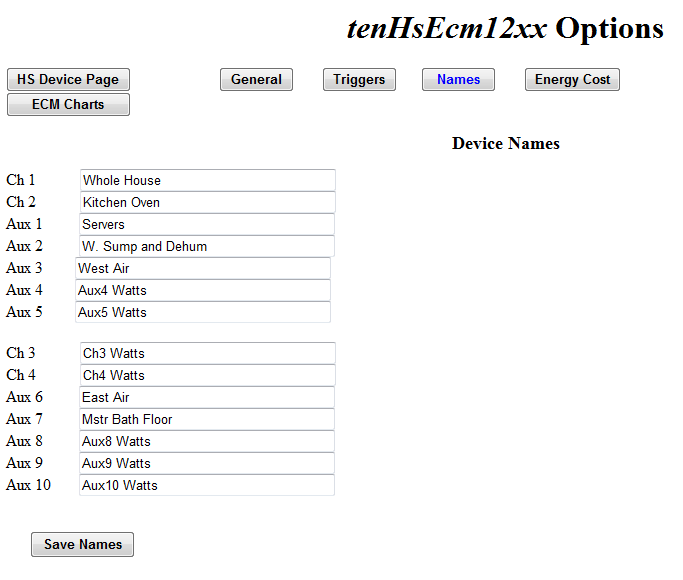 For each ECM channel, you specify the name for the HS Device that tracks the energy use by that channel in watts. When you click on Save Names, and channels that you change will have their HS Device names changed and the plugin will begin using the new device names. Do not rename any of the HS devices from the HomeSeer Status page, as the plugin will no longer be able to find the renamed HS Device. These channel names are also used by the Chart web page. 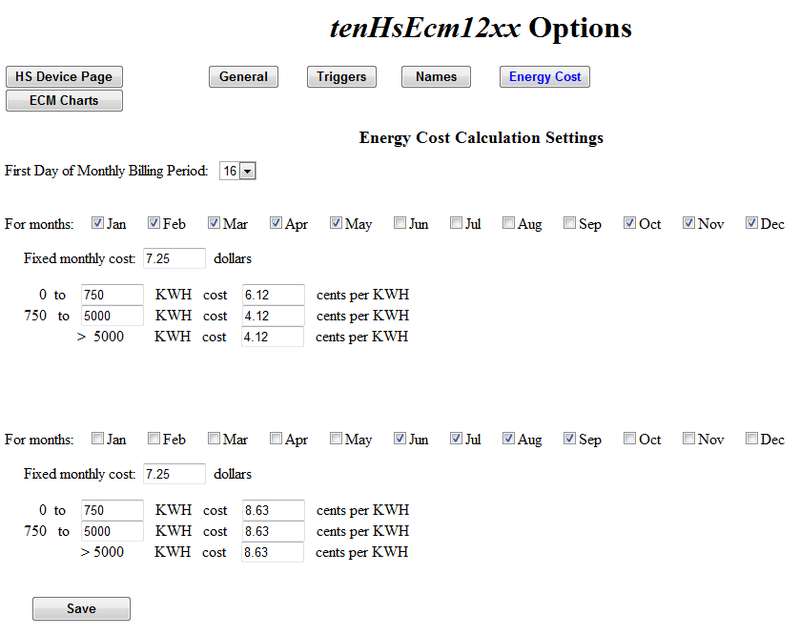 Use this page to set the values used to compute the monthly cost of the energy consumed. The value of the Net Energy Device is used to calculate ongoing monthly cost. You specify up to two rate periods based upon the month of the year. Select the months that are included in each period. Many electric companies charge higher rates for the summer months. Within each period you specify a fixed monthly charge as well as the variable charge based upon the killowatt-hours consumed for the month. You can specify up to three KWH tiers for each period. You also specify the day of the month that begins your electric company's billing period.